Ambulance Service – 1030. The PRCS keeping in view the lack of proper service in the capital launched a state-of- the-art ambulance service 1030 for the capital that will work round the clock and the response time will be 7 to 10 minutes.The service will prove as a milestone not only for the organization but for the city of Islamabad as well. 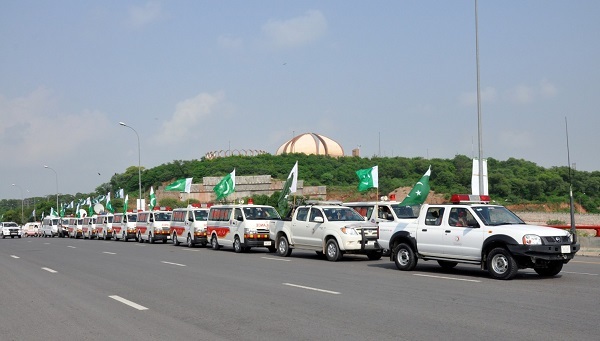 Initially, the ambulance fleet consists of 12 ambulances in which 6 ambulances have been placed at different locations while 6 will remain standby at PRCS National Headquarters.Six ambulances have been stationed at different prominent and accessible sites of the federal capital including D Chowk, Islamabad Club Roundabout, Faizabad police check post, Golra roundabout, Zero Point, and F-11 Markaz. To have a service that offers First Aid on the spot for any immediate evacuation to hospital is of most critical nature. More, so if done by a trained, dedicated staff, which unfortunately has been lacking in our system so far.Each Ambulance is equipped with Oxygen Cylinder with Ambulance bag, Blood Pressure Apparatus, Clinical Thermometer, Stethoscope, Pyodine, Stretcher (fold-able), CPR Mask, Stretcher (fold-able) and Eye Dressing pads.Society undertook a detailed analysis of the current ambulance system of the Islamabad Capital Territory and concluded that the existing system has many gaps that need to be filled and identifying this need has come up with the initiative to enhance the care to patients that are in need of a rescue service within the ICT, by introducing it’s own designated helpline working on 24/7 basis and an Emergency Ambulance Service.